As you probably know, sketch challenges are my favourites. Half of the card is already done by following a sketch! 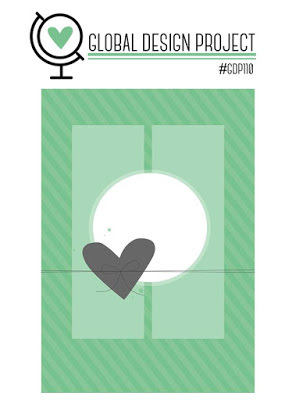 The sketch at Global Design Project is pretty awesome and made putting together my card so easy. Are you like me and save sketches? When I get the chance, I print them and keep them in a file for when I need inspiration. 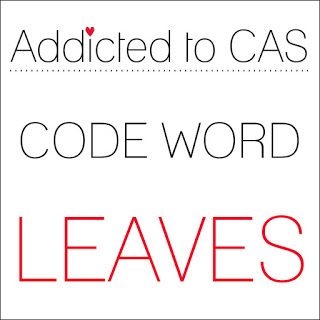 The code word at Addicted to CAS is “Leaves” and the gorgeous inspiration pic at The Card Concept has a beautiful cake layered with leaves. I think the style of this card qualifies at The Card Concept as Classy & Elegant? I combined these challenges and made a neutral wedding card. The designer series paper I’ve used in the background is from a Stampin’ Up retired pack called Urban Underground Speciality Designer Series Paper. This tiny spotted paper was my favourite from this pack. The leaves are cut with Seasonal Layers Thinlits Dies. To create my coloured leaves, I watercoloured some Thick Whisper White cardstock with Tip Top Taupe (sadly retired), Cherry Cobbler and Crushed Curry Inks. The sentiment I’ve used is from Beautiful Bouquet. I stamped this sentiment in the flourish stamp from Label Me Pretty and punched it out with my Pretty Label Punch. I then added a strip of Burlap Ribbon and Copper Ribbon. Because I’m a lover of anything bling, especially on a nuptials card, I added a copper sequin. I managed to play in my craft room mid week! It doesn’t happen very often as usually when I get home I cook, clean up and basically sit on the couch and try and de-stress from work. My eyes and mind are generally too tired to create something inspiring. The challenge that I’ve played along with is the sketch challenge at CAS(E) this Sketch. I’ve created a quick clean and simple Christmas card with non traditional Christmas colours. 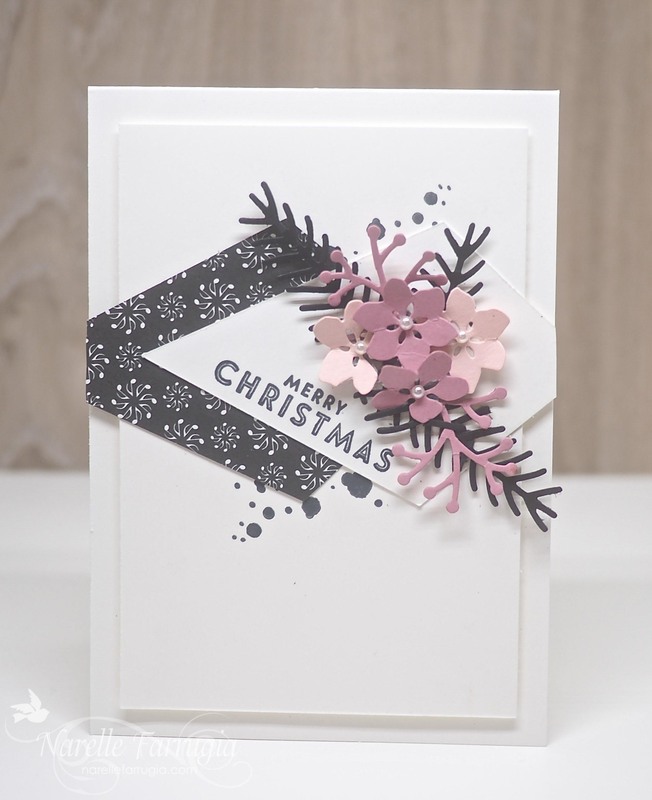 I’ve teamed Powder Pink, Sweet Sugarplum and Basic Black diecuts from Pretty Pines Thinlits Dies and Seasonal Layers Thinlits Dies. The designer series paper I’ve used on my card is from Merry Music Specialty Designer Series Paper. I then stamped the ink splatters stamp from Swirly Bird in Basic Black Archival Ink in the background. The sentiment I’ve used is from Flurry of Wishes. It’s time for a new challenge at Freshly Made Sketches. 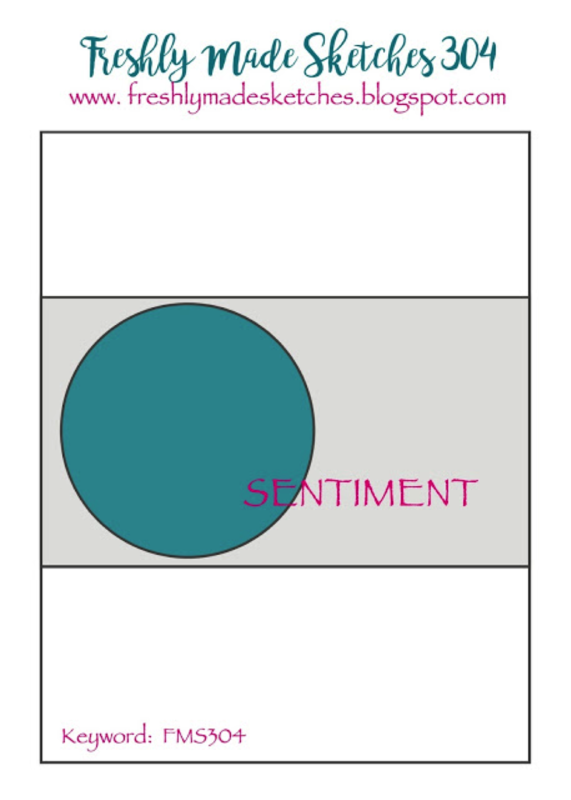 It’s my turn to be sketch designer and I’ve created a simple sketch for you that you can interpret anyway. As always, I look forward to see your cards in the gallery. We are currently renovating our tea room in the Emergency Department I work in and have created a feature wall with cherry blossoms on it. 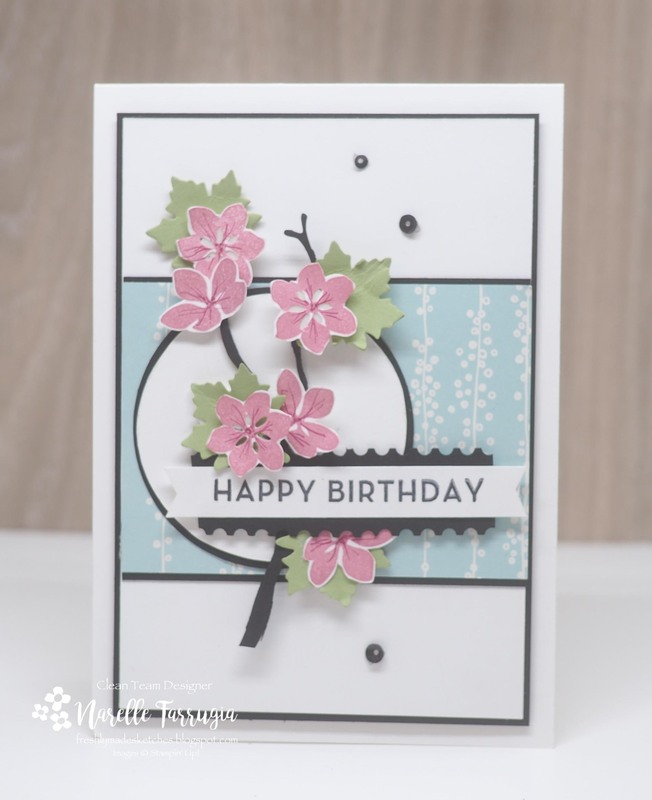 I was really taken with the prettiness of the feature wall, so I decided to create a cherry blossom card with the flowers from Colorful Season stamp set. 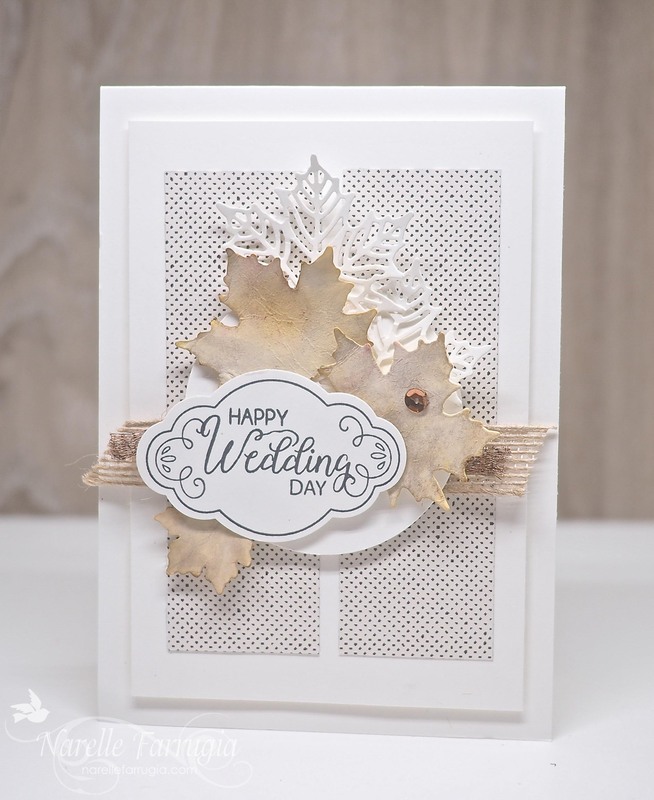 I’ve also used the matching dies from Seasonal Layers Thinlit Dies to cut my leaves and branch. The flowers are stamped in Berry Burst and I’ve used my Berry Burst marker to add crease lines to my flowers. The strip of designer series paper I’ve used is from Bundle of Love Specialty Designer Series Paper. To break up the sentiment from the background I added strips of Basic Black Cardstock that I cut with my Ticket Tear Border Punch. The sentiment I’ve used is from Big on Birthdays. I then added some black sequins to finish off my card. You’re going to want to see the gorgeous cards the design team at Freshly Made Sketches have created. Pop over to the challenge and get ready to be inspired. We have a new challenge for you at Just Add Ink. This week is inspiration picture week. Take a look at this fabulous pic. So many possibilities with this one. I can’t wait to see your take on this challenge! As a huge coffee lover, you’d think I’d go with a coffee themed card, but instead I chose to make a card with the neutral colours from the pic. Seasonal Layers Thinlit Dies has so many wonderful dies in the set. I’ve used a combination of leaves and chair die and layered them with some Burlap Ribbon and Copper Trim. I also stamped the tiny flowers from Colorful Seasons stamp set and fussy cut them just for extra layering. The sentiment is also from this set. 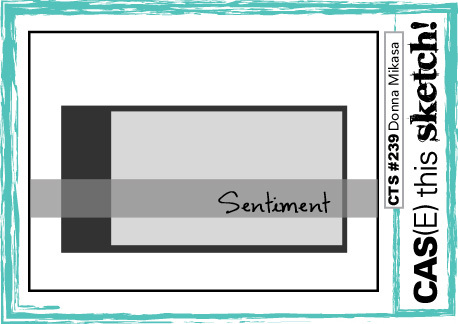 I am loving everything about this set – especially the pretty font in all the sentiments. For the background, I’ve sponged Crumb Cake Ink and added the ink splatters stamp from Swirly Bird in Early Espresso Ink. To tie in with my neutral toned card, I then finished off my card with some copper sequins. 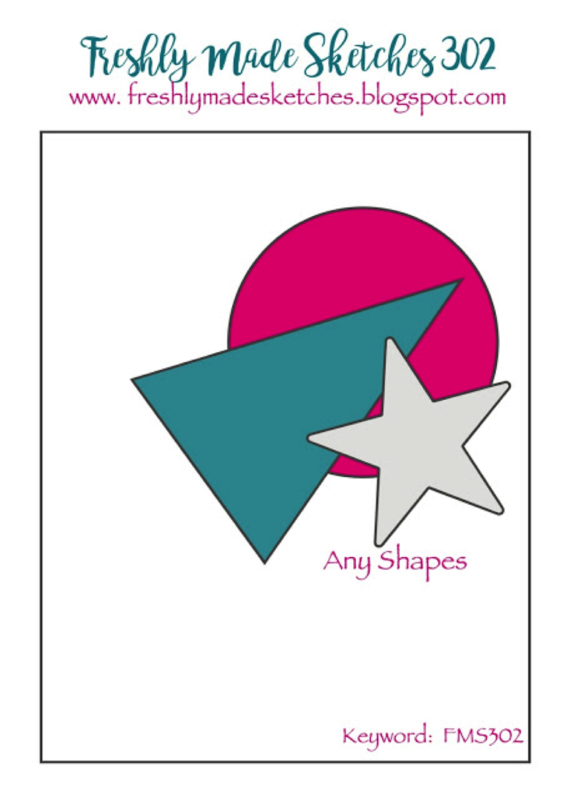 The design team have created wonderful cards to inspire you. I love that we all create such different cards using the same picture. Head over to Just Add Ink and take a look. Woohoo! It’s Wednesday and time for a new sketch at Freshly Made Sketches. 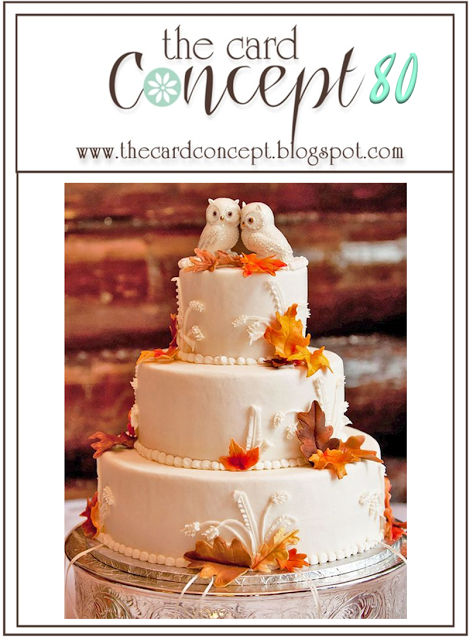 This week our sketch has been designed by the oh-so-talented cardmaker and fab sketch designer – Cecile Ribon! I LOVE, LOVE, LOVE this cool sketch Cecile! I’ve created another Christmas card because, seriously, who can believe Christmas is just around the corner? Again I’ve gone with snowflakes in blue and white colours. 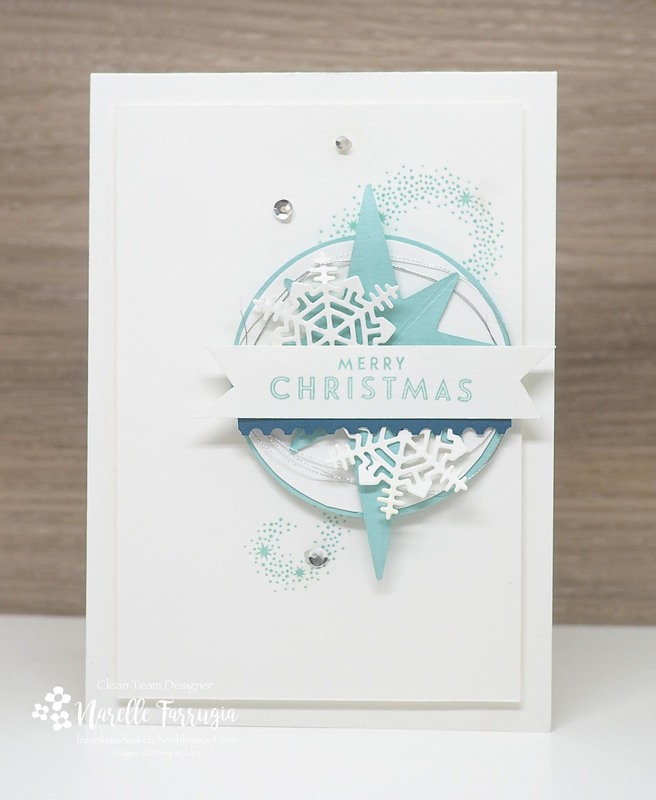 I’ve used a combination of snowflake dies for my card. The smaller white snowflakes are cut with dies from Seasonal Layers Thinlit Dies and the large Pool Party snowflake is cut with a die from Starlight Thinlit Dies. My sentiment is from Flurry of Wishes and the background swirly stamp is from Star of Light. I then added a strip of Dapper Denim that I created with my Ticket Tear Border Punch to break up the all the Pool Party and Whisper White. To finish off my card, I went with some Silver Sequins and some Silver Metallic Thread. The team have created awesome cards to inspire you – head over to Freshly Made Sketches and take a look! It’s time for a new Colour INKspiration challenge! We are kicking off with blog hop this evening! If you have been hopping along you will have come from Jacque Williams’ awesome card. If not, don’t worry you can follow the hop and start again. 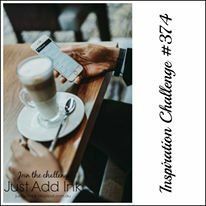 Colour INKspiration is a Facebook Group where you can share your card and be inspired by the creativity there. The colour challenge at Colour INKspiration has most of the design team playing along this week. 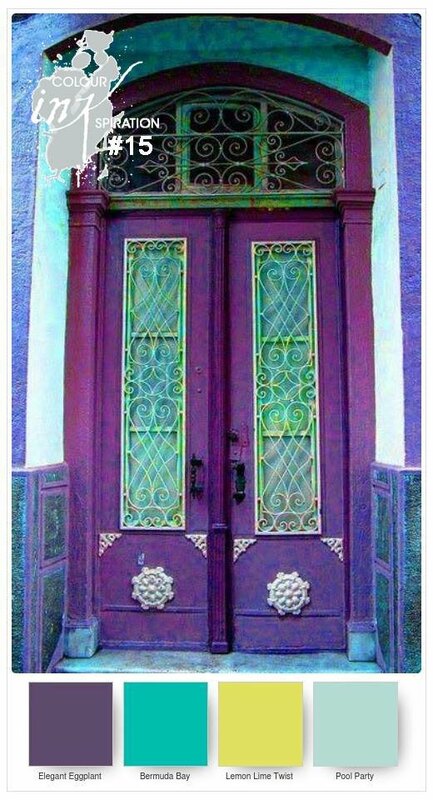 These colours are just gorgeous together and I love how we’ve all used them so differently! 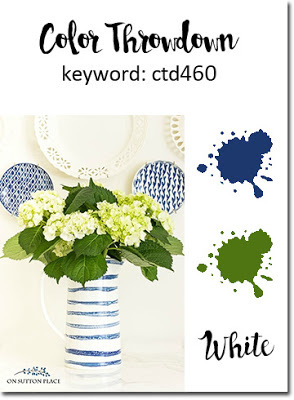 These colours gave me a chance to use my new Stampin’ Up! stamp set – Climbing Orchid. My orchids are stamped with a mixture of all four colours. The leaves are stamped with Lemon Lime Twist and the branch that my orchids are placed on has been cut on my big shot with Seasonal Layers Thinlit Dies. 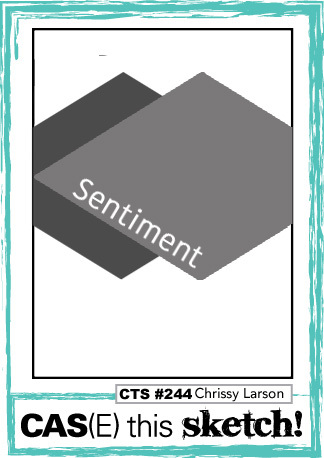 The layout of my card was centred around the sentiment as I was determined to use it on my card. I am loving the font of this sentiment. To finish off my card I used some little copper sequins. The next hop along along way is the very talented and super lovely Simone Bartrum! You’re going to love her card.